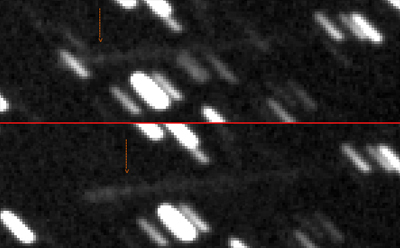 The object is probably the remaining dust/debris resulting from a collision of two asteroids. Read the comments of professional astronomers like Richard Miles (BAA), Michael Kelley (University of Maryland) and Hal Weaver (NASA), please. 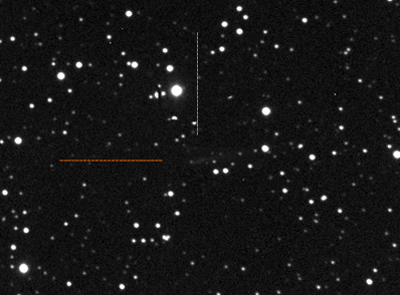 The Hubble Space Telescope is actually observing the structure on some days until June 2010. After the observing campaign we will get new informations. The dust structure is not directed towards the Sun. 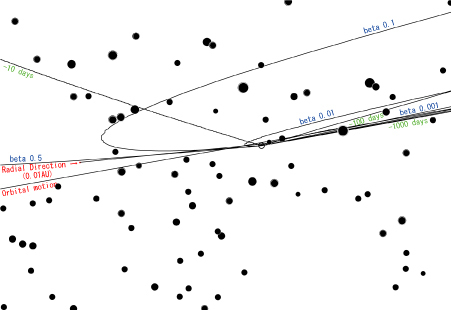 Earth based observations are not able to determine the real direction of the "tail" in space. 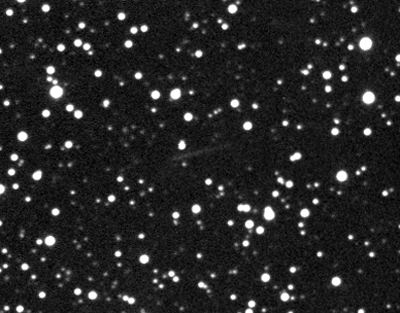 During a meeting of the German Minor Planet Group in June 2010 I talked with Detlef Koschny, an ESA astronomer, about his investigations with the Rosetta probe. He showed me very impressive images taken by the Rosetta probe in April/May, showing the comet on a perspective far away from Earth. 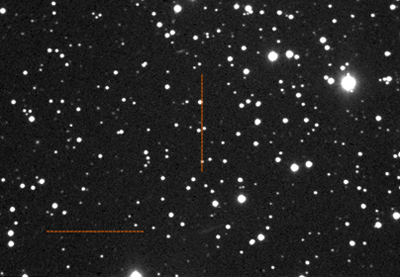 The guys from ESA found out, that the "tail" is directed away from the Sun in a roughly direction of about 45 degrees from the opposite Sun angle. 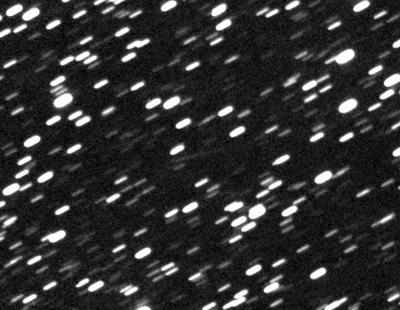 That means, that the "tail" is not a typical comet tail, because it is not directed straight away from the Sun like normal comet tails. 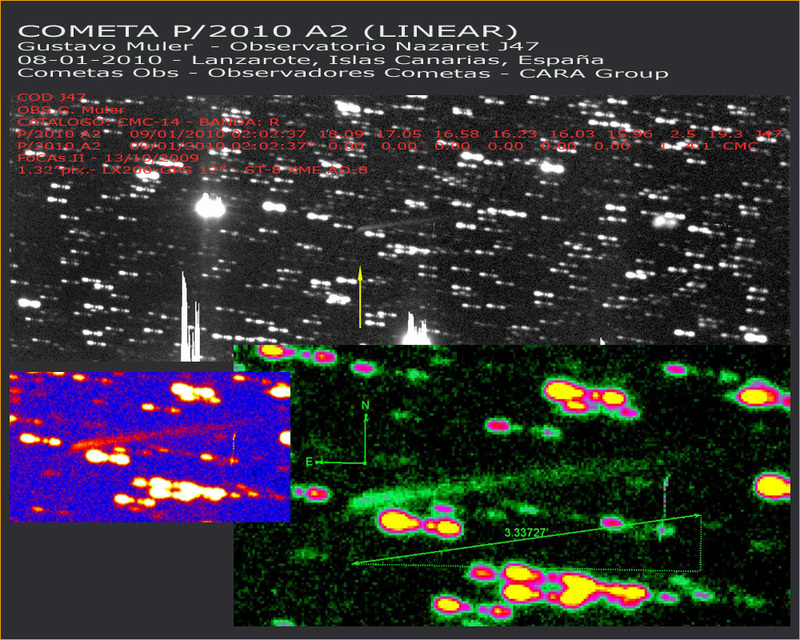 Both NASA and ESA scientists came to the final conclusion, that P/2010 A2 is the remnant of an asteroid collision occured in early 2009. 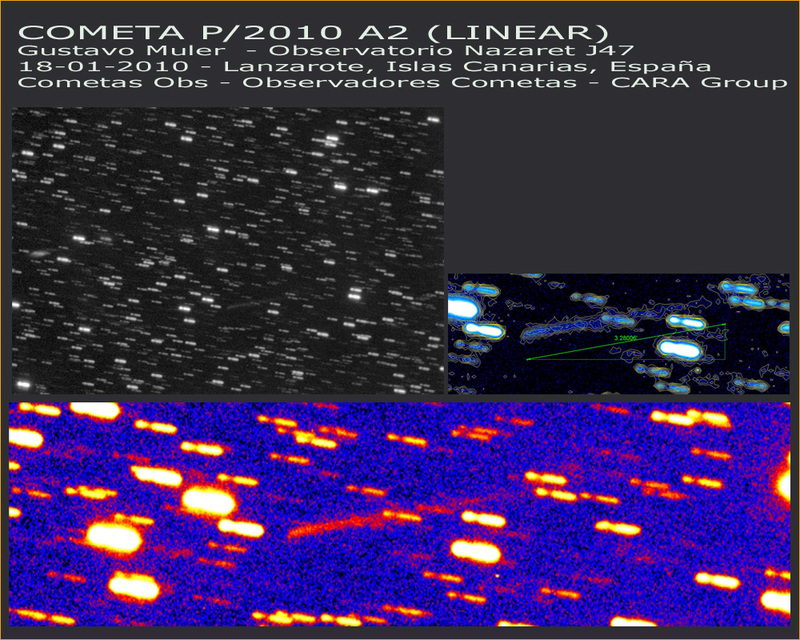 Thanks to the discovery of LINEAR, we amateurs could observe this event never seen before. The dust/debris structure is still very constant since three months meanwhile, 43" in PA 288. 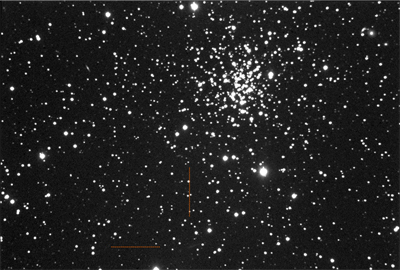 The object is passing the star cluster NGC 2420. The dust/debris structure is still very constant, 47" in PA 290. 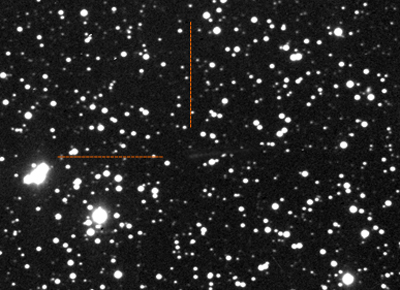 The dust/debris structure is still very constant, 1'03" in PA 286.5.
that the dust/debris/boulder structure is directed relatively to the Sun (Sun Pos.Angle PA 292.3 at Jan, 19 2010). roughly vice versa to the Sun Pos. Angle. The ejected material of the collision should be more compact than comet material. 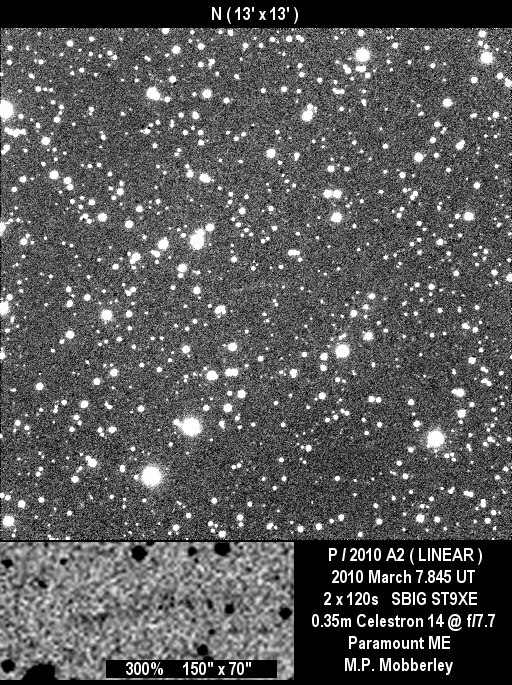 But it seems, that the dust/debris of P/2010 A2 is influenced by both the solar wind and gravitational forces anyway. At the moment of the assumed collision of two asteroids, the direction of the dust/debris is influenced by the impact event, off course. But it is very interesting, that the remaining dust/debris complex is still very constant in shape and orientation. Hiroki Akisawa from Japan calculated synchrone-syndyne network by Bessel-Bredikhin theory and fitted for this image. 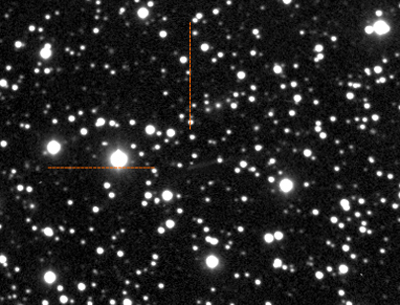 The constitution of the dust/debris/boulder structure of P/2010 A2 should be more massive in comparison to the scattered material of desintegrating comets. I.e. the end of C/1999 S4 (and probably the actual end of C/2009 O2 too) was going on very fast. if the structure has changed. 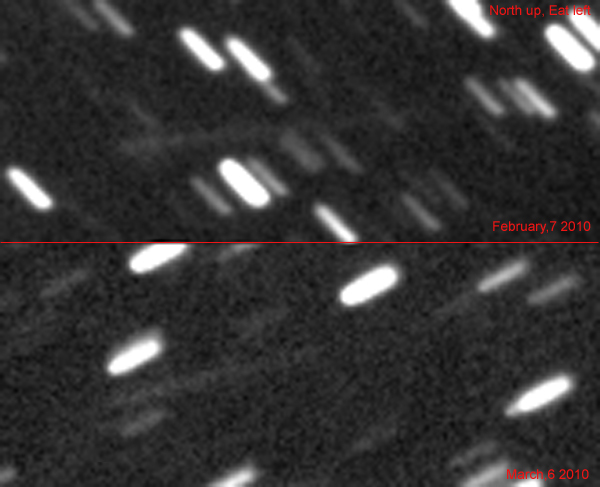 Maybe the Solar Wind will not disperse the destroyed material of the collided asteroids until next year. 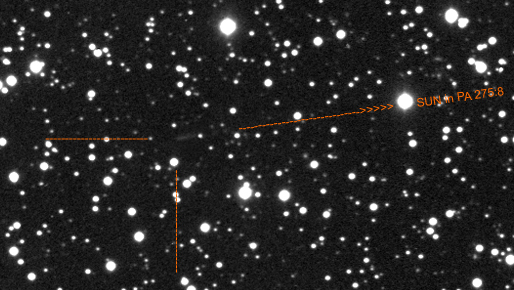 The cometary structure is the result of a collision of two asteroids. 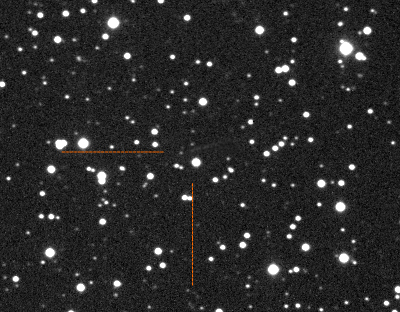 First the object was assumed as a new main belt comet. 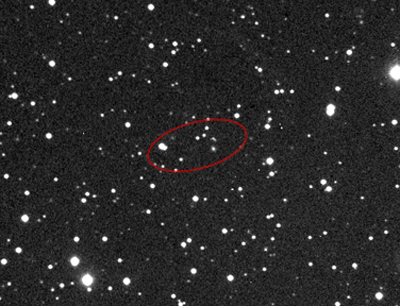 But soon astronomers of NASA revealed the object as an asteroid suffered a collision with another object. left image: The inlay above is showing the an enlargement of the original combined image. On the inlay down I removed the involved stars around the structure. One significant knot is marked. top of this page .